White Chocolate Bunny Ears: Puffy AmiYumi. World Financial Center, NYC, July 11, 2007. Reviews of Pop Music and Beyond. Puffy AmiYumi. World Financial Center, NYC, July 11, 2007. On a warm and sunny July evening last year, Puffy rocked the Hudson River waterfront on lower Manhattan. They were celebrating 10 years as a duo and touring for their new cd, Splurge. The audience was predominantly college-aged Asians, probably not the demographic that was necessarily familiar with their popular cartoon. When Puffy started out in 1996 they were more on the pop side of rock, wearing matching t-shirts and attempting coordinated dance moves. But on this night they were really trying to work on their indie rock cred. 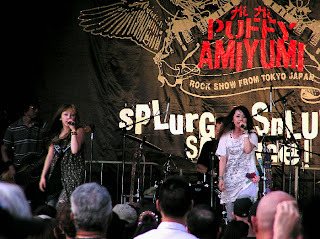 The backdrop on the stage was in black and gold and looked as if it were designed by a Hell's Angel, reading, "Puffy AmiYumi - Rock Show From Tokyo, Japan." They seemed to be distancing themselves from the seven year old fans of their cartoon show. They tried out some songs that showed their new direction, co-written with Jon Spencer (Blues Explosion), Dexter Holland (Offspring), and Butch Walker. Ami and Yumi prowled the stage wearing Boho dresses over jeans. Between songs, they opened their little spiral-bound notebooks and read prepared anecdotes about long train trips on Amtrack, minor health problems, musical flubs and leaving a fly unzipped on stage, all delivered in polite but giggly, little-girl voices. They have to be given credit for attempting to speak in English. Although they are both incredibly attractive, Ami and Yumi have never traded on their looks to achieve success. Their appeal lies more in their wacky senses of humor, their zany fashion style, their embodiment of whimsy, and buckets of charm. Puffy's career has been distinguished by their talented presentation of recycled forms of pop music, convincingly emulating the stylistic expressions of The Who, The Beatles, Elvis Costello, Abba, and ELO, as well as detailed pastiches of punk, country, jazz, and disco, and the varied niches of 1960's American bubblegum pop. On their latest cd they delve into ska and rockabilly. They combine a peculiar Japanese perfectionism along with a wide ranging approach to imitation while retaining a refreshing and idiosyncratic originality.